An extra Room for less than £300 ! After downshifting it's probably the case that you'll be spending much more time at home and it's surprising how that once spacious residence can become a bit overcrowded. With this in mind it may be good to have that extra room, somewhere you or any other family member can get away from it all and what better place to have that little bit of privacy than in your Garden. In my case I brought an 8' x 6' Shed for £180, put an electric feed and broadband cable from the house and here I am now typing away with a view of the Garden along with it's bird table, Vegetable Patch and Chicken Run. A view which is pretty good all year round. It's up to the money in your pocket as to what you furnish it with. In my case the work surfaces are an old door with left over carpet for the top, a shelving unit found in a Skip, a Cupboard redesigned from a throw away Kitchen Cabinet, shelving from various left over woodland a second hand Office Chair. All in all I spent around the £250.....for an extra room, an escape and if need be I could just about squeeze a camp bed in it as well ! It doesn't have to be an Office of course; it can be a workshop, a Music Room (mind the noise though! 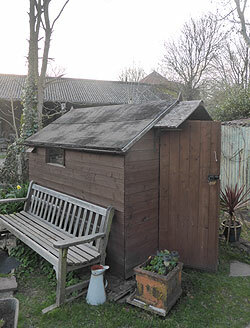 ), even just a commonal garden Potting Shed with Kettle and Biscuits! Security is an issue of course. I have installed an Alarm, you can get pretty good noisy ones for less than £10 on ebay or elsewhere. I purchased a Shed with no windows, then found an old small double glazing unit in a Skip. Just small enough not to fit a body through! I've also put some left over plasterboard around the walls. Remember, Burglars don't just get through a door or window, they'll dismantle the slats to get in. Anything to make it harder is a bonus, especially if it means making a noise doing so. All in all it's been a win win for me. 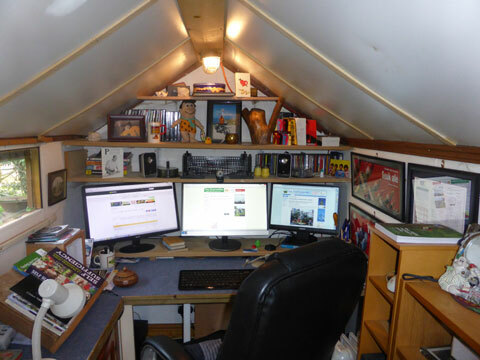 In fact I probably spend more hours in my Shed than I do in the house and the Heating is minimal! The exterior view showing the small window and a rather tatty DIY Shelter above the door - does the trick! I purchased mine from Garden Buildings Direct - arrived in five days then up and running in two!